All this week, we’ll be running college basketball team previews for the 20 (or so) Most Interesting Teams, starting today with the Dangerous Outsiders and working our way up to the Big Guns. Kurosawa’s film Yojimbo begins with a nameless samurai entering a town ravaged by two rival gangs. Both sides try to hire the strange warrior after he slaughters three men without breaking a sweat, but instead of committing his loyalty to either one, he decides to go rogue and take them both down. Murder and intrigue ensue, and by the end of the movie, only the samurai remains. * When the last gangster falls, the Man With No Name leaves town, never to be seen again. Incidentally, Sergio Leone’s A Fistful of Dollars (starring Clint Eastwood) was a Yojimbo remake, as was Last Man Standing with Bruce Willis and Christopher Walken. Films directly inspired by Yojimbo include Django, The Warrior and the Princess, Lucky Number Slevin, and Sukayaki Western Django (which doubles as the weirdest movie of all time). *Sorry, but there’s a 50-year statute of limitations on having to write “SPOILER ALERT!,” and Yojimbo was made in 1961. Clearly, there is something compelling about the dangerous outsider figure, and it seems as good a place as any to begin this year’s college basketball preview. For a Tuesday appetizer, I’ve used real science and precise intuition to identify four teams, ranked near the bottom of the top 25 or not ranked at all, who could become 2012’s Man With No Name. They’re unheralded, unexpected, and capable of surviving amid general destruction. “He’s the most competitive person I’ve ever met in my life.” —FSU guard Luke Loucks, who is ultra-competitive. “He’s the most competitive guy in the league.” —Coach K., another very competitive man who became Snaer’s biggest admirer by the ACC tournament. Now, is it possible I’ve got a slight man crush on Snaer? Yes, yes it is. He’s one of the most fearless college players I’ve seen in person. And if he’s good enough for Coach K., he’s good enough for me. But one player isn’t enough to carry a team, so here are a few other reasons why Florida State could win the ACC and make the Final Four. Size and Defense: This has been Leonard Hamilton’s trademark since taking over in 2002. During his tenure, he’s had a top-25 defense (by KenPom’s adjusted defensive efficiency metric, which essentially shows how many points a team allows per 100 possessions) in six of those years, and the nation’s top defense in 2010-11. This year, his unit will be anchored by Snaer, an ACC all-defensive team selection last year, and Okaro White, a 6-foot-8 junior forward with the kind of quickness and strength that allows him to guard almost anyone. Then there’s Robert Gilchrist, a 6-foot-9 juco transfer, who averaged 2.2 blocks and 7.9 boards last year at Polk State, and actually has a chance, somehow, to be the team’s best defender. And that’s only the beginning. Hamilton also has three 7-footers. One of them, 2011 juco transfer Kiel Turpin, put on 32 pounds over the summer after redshirting last year. He’s won the Division II juco tournament MVP twice while leading Lincoln College to two straight national titles. And what about redshirt junior Terrance Shannon? The 6-foot-8 banger was a starter for FSU in 2011, averaged 10.3 points and 4.4 boards last year, but eventually succumbed to season-ending injuries. He’s back this year, and Hamilton thinks he could be a star. When you lose a defensive genius like Bernard James, it’s hard to imagine that your next team might actually be better. But for Hamilton and FSU, last year’s no. 15 defensive ranking figures to go even lower, especially in a conference where many of the best scorers were lost to graduation or the NBA. Tallahassee’s Tucker Center, where Roy Williams infamously fled the court before time ran out and left his walk-ons to suffer the student charge, will be a brutal venue even for visiting teams like no. 10 Florida and no. 6 NC State. Weaknesses: The point guard position remains uncertain, and will be contested between two freshmen (including prep star Montay Brandon) and 6-foot-3 junior Ian Miller, a capable scorer who looks more comfortable as a shooting guard. While team defense may remain constant or even improve, scoring is almost certain to decrease. With Loucks and Deividas Dulkys gone, and James’s .606 field goal percentage packed up and shipped off to Dallas, White and Snaer may have to carry a heavy load. This will be a tough, grinding team who won’t give up many points, but will be poorly suited to comebacks or scoring in spurts. FSU is classic Javert. Solid, big, dependable. You know what they bring to the table, but it might be a little too rigid in the end. Confident, Insightful Projection: As Duke and UNC struggle to find an identity, Florida State will duel NC State for the regular-season title, with the winner decided when they meet on the last day of the regular season in Tallahassee. From there, the Noles will win the conference tournament before falling in the Elite 8. They can beat anyone on any night, but won’t be dynamic enough to string more than three or four wins together. Once they leave the ACC, every tournament game will be close. The Gist: The year’s best story, bar none. It’s like someone decided to combine Any Given Sunday and Hoosiers, make it about college basketball, and add a dash of Slapshot just to increase the wild factor. For starters, Rick Majerus is on a year-long leave of absence because of a heart condition, leaving Jim Crews in charge. Crews, a former Bobby Knight player and assistant, is a career .500 head coach who made it out of the NCAA first round exactly once in 24 seasons at Evansville and Army, and probably lost the latter gig for physically abusing a player. 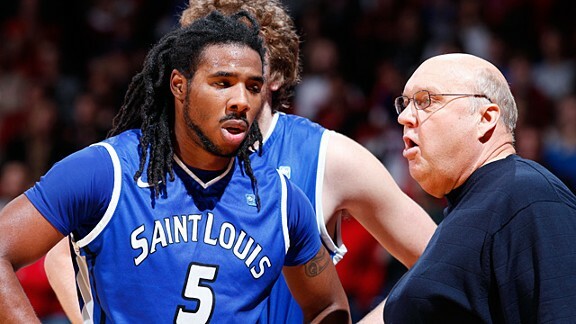 The Billikens lost their best player, Brian Conklin, and are led by a 5-foot-10 point guard who might be out until January with a broken foot and who was suspended two years ago for violating the school’s code of conduct in a case involving accusations of sexual assault. They’re playing in an Atlantic-10 that now includes indie powerhouses Butler and VCU, and will surely surpass the Mountain West as the toughest non-BCS conference in the country. But despite everything, this is a team returning four starters and a horde of upperclassmen from a 26-8 season that ended in the NCAA second round with a narrow loss to Michigan State. Collectively, they are the bad boys of college basketball, and they could be very, very good. Strengths: Defense. The Billikens were 10th in efficiency last season, and this is the area where losing Conklin will hurt them the least. Dwayne Evans, a 6-foot-5 junior, is one of the best defensive rebounders in the country, and the team’s small backcourt makes up for its diminished size with tenacious defending, led by 6-foot-1 Jordair Jett, a member of last year’s A-10 All-Defensive team. Jett may have to fight for starting minutes, especially when injured point guard Kwamain Mitchell (third-team All A-10 last year) returns, and he’ll be joined in the backcourt by Mike McCall Jr., another bulldog 2-guard who can shut down an opposing perimeter threat. Together, the trio was largely responsible for the team’s 23 percent turnover percentage last year, good for 39th in the country. Pace and ball control will also play to Saint Louis’s advantage, particularly at the start of the year as Mitchell recovers. They were among the 50 slowest teams in the country in 2011-12, and all but one of their losses came by single digits. They rarely turn over the ball, and by those two facts alone you can probably start to understand the team profile — frustrate opponents with a snail-like pace, control the ball, and make sure each error is magnified. This is not a good team to trail late in a game. Weaknesses: Scoring. Conklin was a master at getting to the line, and without him the team’s poor free throw rate is likely to decline even further. They struggled to get offensive boards due to their size, and that shows no signs of improving. Mitchell’s injury, and his inevitable adjustment period when he returns, won’t help matters, and there’s no telling how Majerus’s absence might adversely affect team chemistry and efficiency. They’ll need big-time contributions from Cody Ellis, an Australian who practiced with his national team this summer, and Rob Loe, a 6-foot-11 New Zealander with a reputation for being soft inside and trying to tell girls he’s that Rob Lowe. Saint Louis is not impressed by your fancy BCS upbringing! Confident, Insightful Projection: The Billikens are the first team outside the Top 25 in the preseason coaches’ poll, but they won’t stay that way for long. Rick Majerus’s message of control and grit came through last season, and I expect Saint Louis to be one of the toughest teams in the country. The 2012 part of their schedule isn’t as scary as it could be, so they should be able to thrive even before Mitchell returns. They’ll win the A-10, make the Sweet 16 as a 3-seed, and be total hell on a BCS 2. 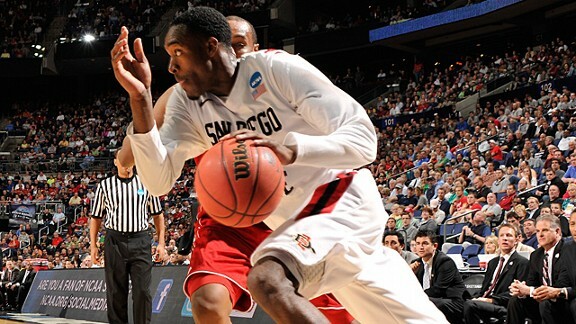 The Gist: Mark it down — SDSU will be 2012’s premier Don’t-Miss-These-Guys-When-They’re-On-TV team. I try to avoid cliches whenever possible, but there’s one college basketball cliche you can take … to the bank … and that’s this: To win a national title, you need “character guys.” Most often, having character guys means having lots of upperclassmen leaders, like almost every NCAA champion from the past decade. In rare cases, such as Syracuse in 2003 and Kentucky last year, it can mean having exceptionally mature freshmen like Carmelo Anthony, Gerry McNamara, Anthony Davis, and Michael Kidd-Gilchrist. This year, the no. 20 Aztecs are the ultimate “character guy” team. They return four starters, including 2011-12 Mountain West Player of the Year Jamaal Franklin, the explosive junior guard who led the team in scoring (17.4) and rebounds (7.9) in 2011-12 and who CBS named a second-team preseason All-American this year. They lose almost nothing in any statistical category except rebounds — where seniors Garrett Green and Tim Shelton were big contributors — but even there, they should benefit from new additions. Strengths: SDSU’s offensive efficiency (points scored per 100 possessions) was lower last season than almost any year since Steve Fisher began his run of 20-win seasons in 2005-06, and that should improve dramatically this year. Along with Franklin, junior guard Chase Tapley (second-team All–Mountain West) returns after averaging 15.8 points per game last year, including 43.3 from 3. Joining them to round out one of the best backcourts in the country is MWC honorable mention point guard Xavier Thames, who finished with 10.1 points and 4.1 assists last season. Questions: The Aztecs’ defensive efficiency was excellent last season, 54th in the country, but a big part of that was the team’s stinginess on the offensive glass, allowing second chances on just 27 percent of all shots. With Green and Shelton gone, this is the biggest concern for Fisher. Along with DeShawn Stephens, who averaged five boards per game last year, he’ll be trotting out several new players, including St. John’s transfer Dwayne Polee II, Utah transfer J.J. O’Brien, and James Johnson, a 6-foot-9 Virginia transfer who won’t be eligible until January. The most exciting freshman is 6-foot-8 Winston Shepard, who went to school with UNLV’s Anthony Bennett at Findlay Prep in Nevada. Shepard has guard-caliber ballhandling skills, and will be going head-to-head with Bennett in the MWC for as long as the two stay in school. All these big men give Fisher incredible depth, but it remains to be seen whether any of them will prove to be a reliable — and physical — rebounding presence. With three strong scoring options at guard, what Fisher really needs is a workhorse or two to complement the little guys. If even one of them works out, San Diego State could be one of the most balanced teams in the country, excellent on both ends of the floor and a true threat to finish in the top five. Lots of passion, lots of excitement, and a high-tempo offense, but you worry the idealism will catch up to them when the French Army — i.e., UCLA — comes calling. Confident, Insightful Projection: After all the hype the Mountain West got last year, it was flameout city come tournament time. UNLV, SDSU, and Colorado State lost in the first round, and New Mexico barely survived long enough to see a second-round exit. The same thing happened to the WCC, with St. Mary’s and BYU dropping in Round 1 and Gonzaga falling in Round 2. Are smaller West Coast teams soft? Check back in March, but in the meantime SDSU should out-duel a relatively inexperienced UNLV team to take the Mountain West with a couple wins to spare. From there, the development of their post players will dictate whether this team can advance beyond the second round. But with a coach as strong as Steve Fisher and a roster full of older “character guys,” I’ve got them penciled in for at least the Sweet 16. The Gist: It took a lot of soul-searching before I swallowed my pride and profiled the team that busted my bracket with a win over FSU last year. Frankly, I still can’t believe it. Go read the game story, and pay special attention to how the FSU players — some of the toughest kids in the country — talk about how Cincinnati’s pressure shocked them. That gives you an idea of the Bearcats’ toughness. It was tough to give them their due, but then again, there are few things I love more than an angry Irishman. And Bearcats head coach Mick Cronin is a Hibernian rottweiler. (I’m actually not sure if he’s Irish, but come on, look at that picture! Let’s just say he’s Irish. Deal?) Cronin has kept Cincinnati on an upward trajectory since taking over in 2006, improving their Big East record from 2-14 that year to 12-6 with a Sweet 16 appearance in 2011-12. This season looks like a transitional one on paper, with Yancy Gates and Dion Dixon, two of the team’s top four scores, gone. But with Sean Kilpatrick (14.3 ppg), Cashmere Wright (10.9 ppg), and JaQuon Parker (9.4 ppg) leading a tough, sharpshooting backcourt (combined, the three were 181-485 from 3, for a 37.3 percent mark), and a host of newcomers ready to help in the interior, Cronin has another bloodthirsty, defense-oriented team ready to make a run in the Big East. Strengths: Now that Dixon’s awful 26.1 percent 3-point shooting percentage is off the roster, Cincinnati has a chance to be one of the top 10 long-range teams in the country. With an offense that might use four guards with regularity, they’ll also continue to protect the ball at something like the 15th-best rate in the country, just like they did last year. If Wright improves his penetration game, this will be a fast, flexible offense that dares the opposing defense to extend. But where this team really excels is defense. Cronin has molded his last two teams into top-25 units, and they’ve been especially adept at producing steals and keeping opponents off-kilter and away from the foul line, as they did with FSU. With most of the backcourt returning, that trend figures to continue. Cincinnati will be hell on teams with turnover-prone guards. Weaknesses: Let’s not put lipstick on the elephant in the room (or something): Losing Yancy Gates was a huge blow. Cincinnati was one of the worst teams in the country at getting to the line, and they let opponents snag a lot of offensive boards. Both of those shortcomings could become worse without Gates, whose bulky 6-foot-9 frame filled a big vacancy in the Cincy interior. It will be all too easy for the guard-heavy Bearcats to play offense from behind the perimeter and cede the inside on D. If there’s a formula for them to avoid that fate, it begins with 6-foot-7 juco transfer Titus Rubles and redshirt freshman Shaq Thomas. They’ll team with junior Justin Jackson and a crop of rising sophomores to provide a rebounding spark. But inexperience, lack of offensive skills, and questionable strength make Cincinnati’s frontcourt a problem area, which is why the coaches’ poll has them three spots outside the Top 25. Man, another Gavroche lyric. He was the Pistol Pete Maravich of the 13th Arrondissement. Confident, Insightful Projection: After surging to a 9-3 finish last year, including a trip to the Big East title game and the upset of Florida State, Cincinnati’s excellent guard class should ride the momentum to a stronger-than-expected Big East season. Louisville and Syracuse are the toast of the conference, and rightly so, but I expect the Bearcats to surge ahead of stall-ball chumps like Notre Dame. And despite their own semi-slow pace from ’11-12, they should be faster than last year and one of the most fun Northeastern teams to watch. I’m calling for a third-place conference finish, another appearance in the conference title game, and a surprise run to the Elite Eight. 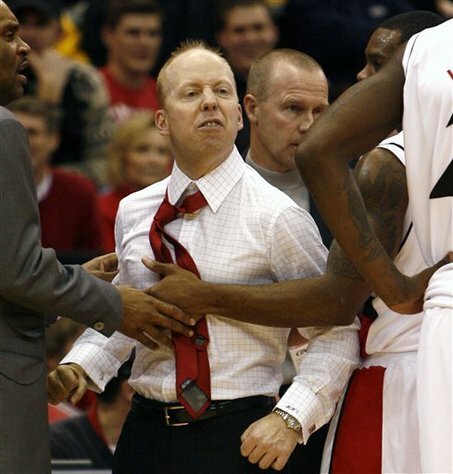 Cronin is too focused and angry for anything less. Grantland's Halloween Costume Contest Returns!